Now this is a little more what we'd like to see from a passively-cooled card. The GT 430 is a far lower-spec beast than the relatively pacey Gigabyte HD 5770 Silent Cell, but what I'm talking about here is not being penalised in the wallet department for wanting something a bit quieter. This is the same price as the Asus GeForce GT 430 and with the same basic specs. What's different, however, is the fact that it doesn't come with any moving parts (and hence no dustproof fan…) and sits on a more normal-sized PCB. This last part is strangely at odds with its raison d'etre. The GT 430 is a GPU to slot into a media centre machine, just like AMD's HD 5570 before it. The first versions we saw came on half-height PCBs for this reason. Now we've got a card that won't fit into a media centre chassis, but comes with the sort of passive cooling you'd want in one. It needs a fair bit of airflow across those passive cooling fans too: in our test-rig it was quite capable of hitting over 90°C when it was stressed at all. So them wee cases are right out. As for performance, you're talking near-identical scores to the Asus GT 430. But this isn't about performance, it's about delivering Nvidia's DX11 goodness and its GPU extras, like CUDA, into the low-end market. Personally though I think for this sort of card, the half-height PCB makes more sense: after all, the dustproof fan on the Asus card isn't exactly going to sound like a turbine, is it? 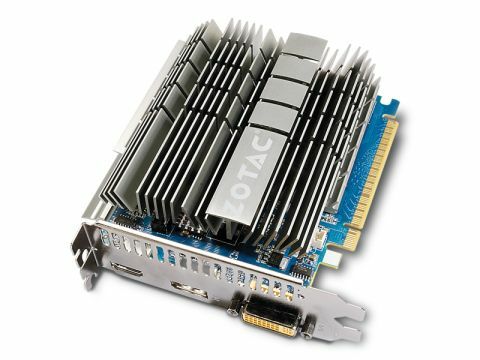 Putting it onto a larger board means Zotac can offer this passive-cooling array, but is going to seriously limit where the card is able to be installed. I'd want the GT 430 for a small form factor machine. If you've got anything larger, save up and spend an extra £25 to £30 on a GTS 450 instead.